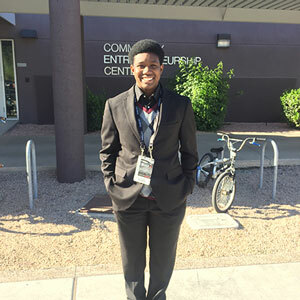 PHOENIX, Ariz. – March 2016 – On February 27, fifteen South Mountain Community College (SMCC) DECA club students attended the State Career Development Conference at Grand Canyon University. The students competed against seven other universities and colleges in various business fields. Ryan Lindale took first place in Professional Sales and Christopher Villagrana took third place in Accounting. 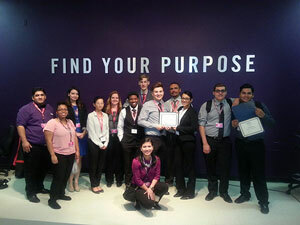 Georgina Mendoza, Kaiya Henderson, Jazmine Bustillo, Glydel Jabagat, Jonathan Raus, Angel Chavez and Ryan Lindale qualified for the International Career Development Conference. The seven students will compete at the conference to take place in Washington DC on April 15 – 20, 2016. SMCC DECA also won an award for the largest Collegiate DECA chapter in Arizona with 58 members. Barbara Gonzalez, Club Advisor and SMCC Faculty, received the award for Collegiate DECA Advisor of the Year. 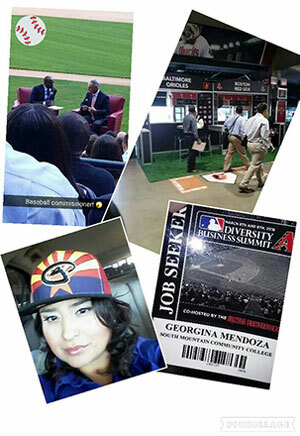 On March 8 and 9, SMCC DECA members, Georgina Mendoza and Kaiya Henderson were selected to participate in the MLB Diversity Business Summit. For more information about SMCC’s Collegiate DECA or Business programs visit, www.southmountaincc.edu.